I thought this name would be so appropriate because of what I see when I look around in the Black inner cities across the country. Sure, fast food may be great corporate business for those who profit from our ignorance, but in the end, it’s not good for those of us who do not have the sense to understand that this type of food (If you can call it that!) is killing us slowly and in not our best interest to consume. Our children arrive freshly out of the womb and in no time they know who Ronald McDonald is before they know anything of their own culture! Their minds are relentlessly pursued and eventually programmed by the mass media campaigns of those “death food” merchants competing for complete dominance over your childrens taste buds. You see those “Golden Arches” ( I’m just picking on McDonalds, but it’s also pus pits like Burger King , Popeye’s, Wendy’s, KFC, White Castle, Checkers or Crystals etc.) and your mouth starts to salivate, like a trained monkey! Half of the time you are not even hungry or even are in need of any nutrition. The sad part that if you were in need of any essential nutrients, that garbage that you are addicted to could only be used as embalming fluid at the local mortician. And we wonder why we look the way we do….go to any mall and watch our young girls who stuff themselves into clothes too tight thinking they are attractive with the exposed cellulite and the guts overhanging and jiggling. I know it’s hard to face these things but we as Black people are out of our minds to accept this as normalcy. I know many of you won’t like me anymore for saying these things, but as an artist I have to illustrate what I see truthfully. We are eating ourselves into poor health and are not living the full life that God has intended us to live. To be sick is abnormal. That is a fact. We are not supposed to expire from disease; we are simply designed to “expire”. But because we are putting devalued “stripped out” food into our vessels, we set our selves up for diseases to come in. And with food that is not designed for us to live a strong vibrant life, we can’t function to the fullest. Remember as a child when you could effortlessly run all day and night without even thinking of fatigue. Your system was new, your internal organs were fresh. Why is it that a mere twenty years can pass and you feel so many aches and pains and your enthusiasm to move about the earth is quelled? It’s because of a disobedience to the laws of how our bodies function. The answer is not in a pill that we ingest or a cream that we can apply to our skin. 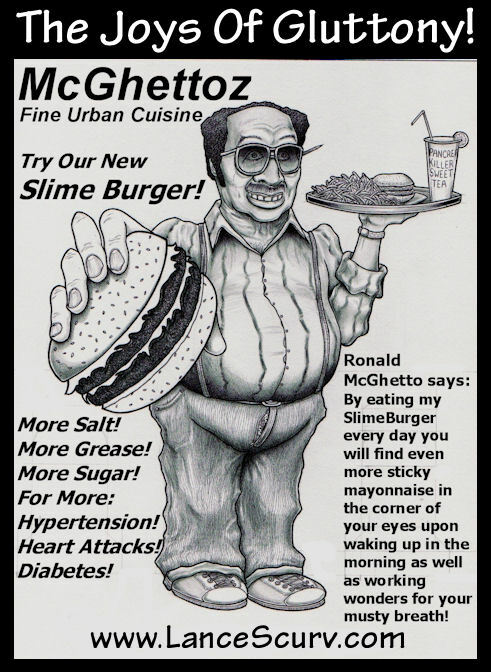 There is a way to have superior health and drop dead gorgeous looks well into ripe old ages but there are rules to this thing….and it ain’t coming from a meal at McGhettoz! It cracks me up when I am in my car waiting for the red light to change and here comes some clown driving up next to me in a new car with more pork fat on the back of his neck than the floor of the local butcher shop right before the Labor Day weekend cookouts. Homeboy was sitting in a automobile that resembles a spaceship unlike the new car that he drove off with from the showroom floor days earlier. He was looking at me as though I was inferior to him ‘cause I was in a plain older vehicle. The point is that some of us will honor, worship and adore our cars more than we will our divine physical bodies to which there is no replacement. You see, we can always pick up a new alternator when the one we have goes bad, but what do you do when you pancreas begins to malfunction? Your heart. Your lungs. Dammit…..your brain! Can you pick those up just as fast at the local body part joint? We were never taught the proper way to eat in these schools of indoctrination because most of the time we are reared on junk food for lunch that is served right in the school from when we were young. We don’t concern ourselves or even know about getting the right amount of protein, complex unrefined carbohydrates and essential fats and clean fresh water. For the most part when most people get hungry, they just say “Let’s get something to eat!” ….and what are the choices usually? Burgers, pizza, Chinese food, fried fish or chicken. This is the limited variety that you think you can flourish on? Yet and still when the prospect of going on a detoxification diet consisting mostly of fresh fruits and vegetables is brought up, you get mad and mention that you need variety! There are limitless varieties of nutrient packed and delicious foods from nature that one could enjoy if you only knew how to prepare them or were even exposed to them in the first place. But you don’t know a damn thing except a happy meal. Why do you think we have 24 hour drug stores like “CVS” or “Walgreens” open all night long? We should be in such good health that it would force them to close because not one of them could make a sale after midnight. There is a law of cause and effect and we as Black people, need to proactively take charge of what we consume and stop being played by the corporate food thug companies who have brainwashed us out of the true God given way to keep ourselves on point physically. They don’t teach you truth in school but will they teach you this in church? Or is the pastor afraid to insult that 300 pound potato salad eating church lady who pays triple tithes, donates a huge offering and gives the most to the church building fund every week? The knowledge is out here to gain but it’s up to us to refuse to continue to be food junkies and detox from your oppressors evil and very profitable plans on your health. Next : The Science Of Haters!